Does anyone else think that this woman is in dire need of a makeover? 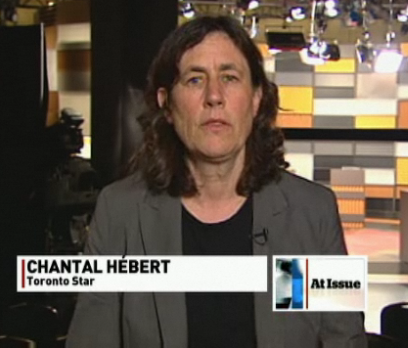 Chantal Hebert is part of CBC's At Issue panel...and has been for a while. The only think that has changed about her appearance over the past ten years is her hair. An unimpressed face, unkempt hair, and lots of grey clothes (that usually consist of a turtle neck and blazer). So after tonight's election debate (which I watched...on mute) Chantal and the other panel members were on to say their piece about what they heard. I just could not take my eyes off her appearance. What a disaster. It has gotten worse than it was during the last election (or the one before that...I don't remember, there has been so many)...at least the non-brushing of her hair was less noticeable when her hair was short....but now it looks like a monster on top of her head. Can someone please give this woman a makeover? Show her what a Chi is....get her away from her black and white TV and show her the wonderful world of colour...and tell her that people will still take her seriously even if she is wearing a bit of makeup. i can't agree with you on all your loves & hates (although some of them are awesome! ), but girlfriend you got it right on the nose with this post! i'm watching "at issue" right now and can't believe this woman continues along, looking like that! she's so bright and well-spoken, but image-wise she's a train wreck! wth, chantal? !